When we were children we had a gooseberry bush in the garden. My mother would make countless crumbles, jams, chutney and fools with the tart slightly fuzzy berries and whenever she wasn’t looking we’d eat them straight off the bush. I can never resist buying a punnet when I see them. Gooseberries have a wonderful tart taste that very much comes alive when baked. 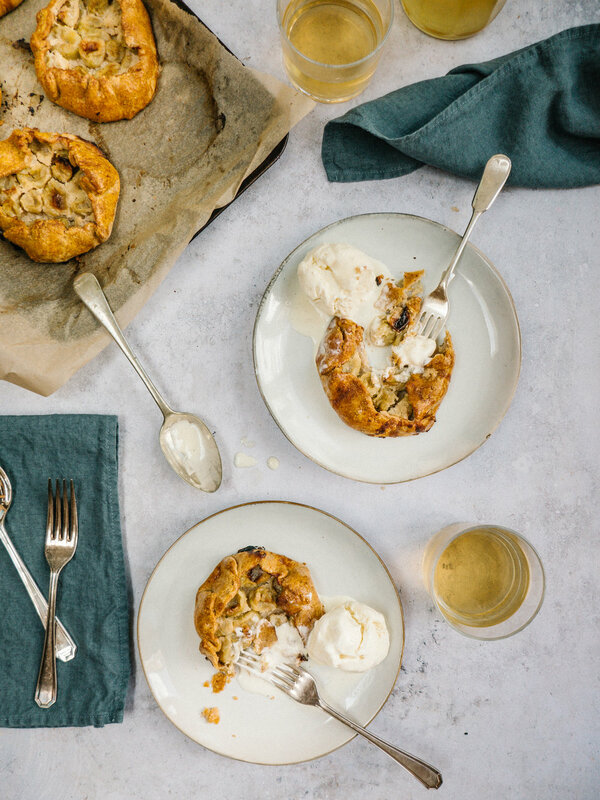 I love the nuttiness of these tarts which are perfect with a scoop of ice cream. For another way of baking with gooseberries try my Orange, almond, gooseberry cake. 1 egg yolk, lightly beaten or 3tbsp milk. Preheat your oven to 180 degrees- fan setting. Spread the almonds on a baking sheet and toast in the oven for 10-12 minutes until they begin to smell nutty. Remove from the oven and allow them to cool completely. You can also turn off the oven. Place them in a food processor and pulse until you have a course, flour-like texture. Transfer to a bowl. Add the flour, cinnamon and salt to the food processor and pulse to combine. Add the butter and about half of your nut flour and pulse until the mixture is crumble-like. Do not over pulse or you will melt the butter. Add the egg and the ice cold water and pulse just until the dough comes together. Remove the dough and divide it into 2 disks. Chill in the fridge for at least an hour. Preheat the oven to 180 degrees – fan setting. Line 2 baking trays with baking parchment. Toss the gooseberries and sugar in a medium sized bowl. Lightly flour a clean surface. Take one pastry disk and divide it into four equal sized balls. Roll these out till roughly 15cm diameter placing the disks onto the prepared baking trays. Sprinkle equal amounts of nut flour onto each, leaving a 2cm boarder of pastry. Divide your berries equally among the tarts, leaving the 2cm pastry boarder. Gently fold the pastry to encase the berries. Once folded give the pastry a squeeze to secure it in place. Bruch the pastry with the beaten yolk and bake for 30-35 minutes until the pastry is golden brown and your gooseberries have cooked and softened. Enjoy with fresh cream or a scoop of ice cream. These are best enjoyed warm and will reheat very well too. Just heat them up in a preheated oven of 180 degrees to reheat them.